October 27, 2012 – Cosmin Pohoata – Everything about Symmedians! Cosmin Pohoata will return to the Metroplex Math Circle this week to give a talk on symmedians. This will be an excellent lecture particularly for some of our more advanced students and those preparing for mathematical contests where symmedians can be a powerful part of their tool kits. Abstract: We will introduce symmedians from scratch and prove the entire collection of interconnected results that characterize them. Applications from contests around the world will also be presented if time permits. 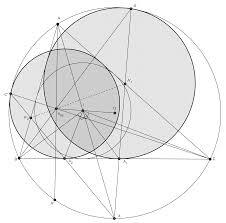 Constructions using only the compass and the unmarked ruler (straightedge) have always been something to be enjoyed by triangle geometers throughout time and to inspire many Olympiad problems nowadays. Here, we will see why this subject can be so appealing and will cover a few basic constructions for afterwards to challenge ourselves and see how these serve as natural “macros” for constructions which at first sight seem out of reach.